Six Sigma emphasizes the Control phase and planning for it because previous attempts at improving quality and business performance repeatedly demonstrated that process behavior is complex and fragile and that hard-earned gains slip away if the process is left to itself. A process is a system of events, activities, and feedback loops. A well-designed process exhibits inherent self-control, while a poorly designed process requires frequent external control and adjustment to meet requirements. Some people use the terminology tampering with the process to describe such adjustments. In the Six Sigma control phase, your action in developing a control plan — and the knowledge that you gain from it — virtually guarantees you that the improved performance you’ve worked so hard to achieve will stick. Before Six Sigma came along, developing process controls tended to be like trying to boil the ocean. Organizations would often go to herculean efforts to have an exhaustive plan for every process and every detail of every process, regardless of the importance of the process. It was like trying to eat the proverbial elephant in one bite! Six Sigma, however, gives you the ability to pick out the most important processes and to identify the input and output variables of the process that matter most. This prioritization changes the control effort from a broad-swathed flashlight to a focused laser beam. Developing a control plan for a Six Sigma project is not only a much easier alternative but also an absolutely essential activity. Process monitoring of outputs uses a tool called a process management summary. The objective of the process management summary is to enable the visibility, review, and action for all critical process outputs in an organization. Process control of inputs uses a tool called a process control plan. The objective of the process control plan is to create systematic feedback loops and actions to assure the process has inherent, automatic control. With a good process control plan, you can change people, equipment, materials, and production rates without significantly altering the performance quality of the process. 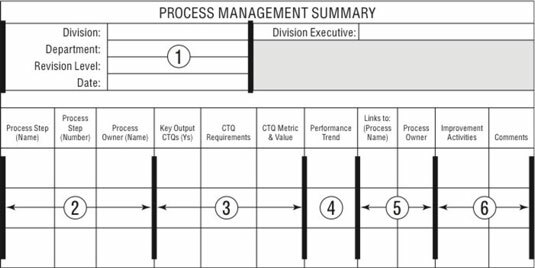 Use the process management summary to collect all the critical-to-quality outputs, or CTQs, for a process, a department, a division, or even an entire company. Roll up the summary to whatever level your organization needs for monitoring, reviewing, and taking action to assure acceptable process and business performance. Each time a Six Sigma project is completed, add that project’s CTQs to the summary. In this example, the administrative section of the summary is where you identify the organizational areas involved, plus the revision level and date of the information. The summary’s purpose is captured in the main body, where you provide enough information for anyone to readily see the current status of the CTQs, how they relate to downstream processes, and what actions, if any, are currently being taken. The process control plan is your companion to the process management summary. Use the process control plan to focus on the Xs — the inputs to the process. The inputs, by definition in the formula of Y = f(X) + ε, are the critical Xs that are determined from the Six Sigma project. But you can place process outputs, the Y (the CTQs), on a process control plan, too. When done correctly, the process control plan creates a complete picture of all possible inputs, outputs, and activities for a single process. The administrative section of the process control plan is where you provide key information for identifying the process, including the owner. It also includes revision control information. Section 2 is a larger space for you to write an operational definition of the control plan. The information in this field helps people understand why the process exists — what its value proposition is — and helps put the control activities into proper context. In Section 3, identify what is specifically being controlled. Use Section 4 to specify the spec limits or other requirements and the key performance metrics and values. People can look to this section to see quickly how well the process is performing and how the control activities are going. Section 5 is where the rubber meets the road. This section is where you identify the control methods and measures and the actions you want taken if the process goes out of control. The control methods may include checklists, mistake-proofing methods, statistical process controls, or any other appropriate procedures. Control methods likely include the use of automated data collection and process intelligence technologies. Note that in this section, you also specify the required sample sizes and the frequency of sampling in order to provide the proper feedback to the process. This feedback is important, just like it is when you’re driving a car. If you don’t have the right amount of feedback at the right time to keep your car going down the center of the road, you may suddenly find yourself in the ditch. The same is true for keeping a process on track. Also include in Section 5 the action(s) you want to be taken if the controlled parameter doesn’t meet its requirements or stay within its specification limits. This action is analogous to an in-case-of-emergency plan — it’s what to do and who does it. A sense of emergency always exists when an input X, an output Y, or a CTQ goes out of control! In Section 6, list the names of any governing documents for the process and any standard operating procedures (SOPs). With a good process control plan, you’re ready to hand your project off to the process owner and process workers, confident that they can sustain the improvement your efforts have made.